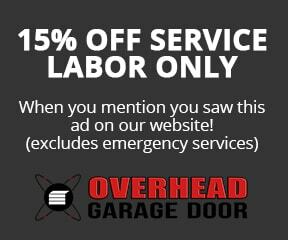 Libertyville Garage Door Repair & Installation | Overhead Garage Door Inc. When choosing the right service for your garage door repairs, it’s important to go with a company that’s licensed, bonded and insured. Many competitors may have competitive pricing but lack the licenses and insurance policies to ensure a quality service. The Better Business Bureau warns consumers of garage door repair scams and encourages you to do your homework before selecting the garage door service for you. Overhead Garage Door gets the job done right the first time. Our customers rave on Angie’s List with over 350 reviews. I have 3 contractors who I’ve used regularly for anything from a stopped drain to a 3rd floor addition. When the garage door literally fell of the track, I immediately reached out to my trusted 3 and its crazy that they all recommended the same outfit. I made one call with complete faith and the repair was painless and reasonable. I have since talked to neighbors who had lesser problems but described nightmares dealing with other local companies. I’m happy to say my 3 has now grown to 4. Overhead Garage Door is a proud sponsor of the Libertyville Little League Baseball club. Call Overhead Garage Door and get a repair quote today. For over 35 years Overhead Garage Door has been servicing Lake County. We understand urgency and are on call to Libertyville around the clock. Our mission is to provide the highest quality products and service in the industry. Contact us for the best garage door repair service in Libertyville.